Interested in developing embedded systems? Since they don&#8217;t tolerate inefficiency, these systems require a disciplined approach to programming. This easy-to-read guide helps you cultivate a host of good development practices, based on classic software design patterns and new patterns unique to embedded programming. Learn how to build system architecture for processors, not operating systems, and discover specific techniques for dealing with hardware difficulties and manufacturing requirements. Written by an expert who&#8217;s created embedded systems ranging from urban surveillance and DNA scanners to children&#8217;s toys, this book is ideal for intermediate and experienced programmers, no matter what platform you use. 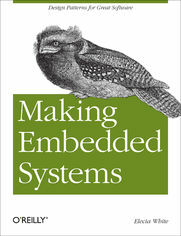 "Making Embedded Systems is the book for a C programmer who wants to enter the fun (and lucrative) world of embedded systems. It&#8217;s very well written&#8212;entertaining, even&#8212;and filled with clear illustrations." &#8212;Jack Ganssle, author and embedded system expert.